Why should I use Scrubbles? Will I have any liability or need to pay any taxes if I hire a housekeeper? Should I tip my house cleaner? Can I hire one of your cleaning professionals directly? Scrubbles has been providing local residents with flexible and reliable residential cleaning services since 1981. We’ve cleaned hundreds of homes a week for nearly three decades! By now, we’ve perfected our formula for great service. Every Scrubbles employee undergoes a rigorous screening process that includes extremely thorough criminal background checks. Additionally, all Scrubbles employees are fully insured and bonded. No. Scrubbles goal is to reduce the number of your responsibilities in life; certainly not add to them! Most homeowners are unaware of the risks of hiring independent cleaners, who often pass the liability for work-related injuries and the responsibility of payroll taxes onto their clients. We will provide you with a comprehensive list of our wide range of services, so that you may choose what you’d like us to do for you. 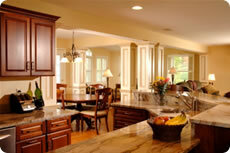 Scrubbles offers regular housecleaning on a weekly, bi-weekly and monthly basis. In addition, we are available for special one-time cleans. These include move-in/move-outs, deep cleans, new construction clean up, and occasional maintenance cleans for customers that just need a little extra help. Our goal is to provide you with consistency no matter what; even if circumstances demand a staffing change. Every employee is extensively trained to utilize the same efficient, effective cleaning techniques. Absolutely. We have a 100% satisfaction guaranteed policy. Payment is due the day the service is performed. You may pay by check, Visa, or Mastercard. Many customers leave a check, payable to Scrubbles, on their kitchen table or countertop. For your convenience, if you prefer paying by credit card, a number may be left on file with us to use for each cleaning. Our employees are not available for direct hire. A great deal of time and resources is put into hiring our staff.